This solid wood pistachio server is designed to offer an elegant solution for storing discarded shells. With a nod to the form and colors of pistachios in the shell, this two-tiered server is perfectly designed to solve the nut's perennial problem: the leftover debris that piles up in your hand, in your pocket, or in the aftermath of a party. Featuring an organically coordinated, pistachio-green rim, the upper tier holds 8 ounces of whole nuts, while the lower, broader level offers an elegant solution to stash the shells without fumbling for a makeshift discard dish. It's routed from solid, sustainable North American Maple, hand sanded and finished with teak oil for a smooth, food-safe finish. The tiers come apart for easy, tidy shell disposal. Made in Dorset, Vermont. Pair your Pistachio Pedestal with our Roasted and Salted Pistachios. The UncommonGoods Product Development team identified a problem inherent to serving pistachios—the mess produced by the discarded shells—and sought a design solution that was easy to present, serve, and clean. With guidance from our team, J.K. Adams developed and produced the Pistacho Pedestal. The design enables you to serve pistachios in the shell in a convenient and attractive way that incorporates space to dispose of the shells. The Pistachio Pedestal design elegantly responds to the downside of whole pistachios—the leftover shells. 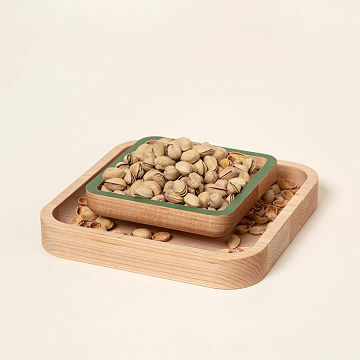 The upper tier of the connecting, two-piece design holds whole nuts in an attractive server rimmed in pistachio green, while the lower tier stows discarded shells in a convenient, unobtrusive space until easy disposal. Teak oil, North American native wood (natural source materials), and milk paint. The Pistachio Pedestal is packaged in a partially recycled and recyclable/compostable corrugated box, with partially recycled and recyclable/ compostable paper fill. There's one place—and only one place—where you'll find the Pistachio Pedestal: UncommonGoods. It's perfect for entertaining, Appetizers, buffets or just to have out for snacking. Love It! No mess way to eat pistachios! Great product , great gift! Will likely buy more! Beautiful - Sturdy - FUN! The Pistachio Pedestal is perfect for munching nuts with friends at the bar and keeps all those shells "at bay!" I bought this for my mom after seeing and using one at a friend's house. It is a stylish, useful and well made product. Perfect for every pistachio lover! Perfect solution as to where unopened nuts AND opened nuts go. Well designed so that top part fits onto bottom nicely and is easily lifted to dispose of shells. My advice is to get one! A well-made and unique gift for pistachio lovers. This product is well-made and very practical. It eliminates the need for a separate container to hold the shells. I buy this product again and again for a gift! I keep this dish out and filled with pistachios.. as soon as all of them are eaten I fill it up again! A must have for entertaining or to use for healthy snacks during movie night!